Abstract: Extrapulmonary small cell neuroendocrine carcinoma (SNEC) is an extremely rare and highly malignant tumor with a poor prognosis. Multiple metastases of SNEC are even more rare, and patients with locally advanced and metastatic disease generally face a poor outcome. To date, only a few cases of SNEC have been reported. 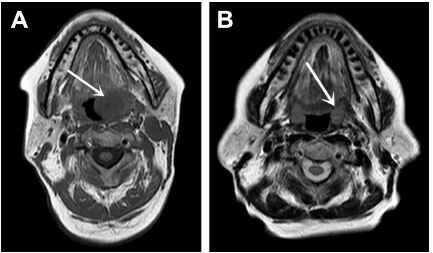 Here, we describe a rare case of a 70-year-old female patient with SNEC of the tonsil who presented with multiple metastases and had achieved a complete response (CR) of the primary lesion and cervical lymph nodes for more than 1 year after receiving palliative chemotherapy. Initially, the patient presented with a 2-month history of throat pain. Magnetic resonance imaging and computed tomography revealed a soft mass with moderate enhancement on the left tonsil, which was confirmed by incisional aspiration biopsy. She was additionally sent for a positron emission tomography scan to evaluate small metastases in the left cervical lymph node, right lung, multiple mediastinal lymph nodes, and the fourth lumbar (L4) vertebra body metastases. Histopathological examination of the SNEC confirmed a nested, typical endocrine appearance with small round cells containing ovoid-shaped nuclei and high mitotic activity. Immunohistochemically, the tumor cells were positive for cytokeratin 8/18+, synaptophysin+, CD56+, and Ki-67 (>50%). The patient received 6 cycles of cisplatin combined with etoposide and was subsequently placed under close observation (>12 months). To date, she has achieved a CR of the primary lesion and cervical lymph nodes. In summary, we have described a case of successful treatment after chemotherapy for SNEC and have elucidated professional knowledge regarding the relevant aspects of SNEC.